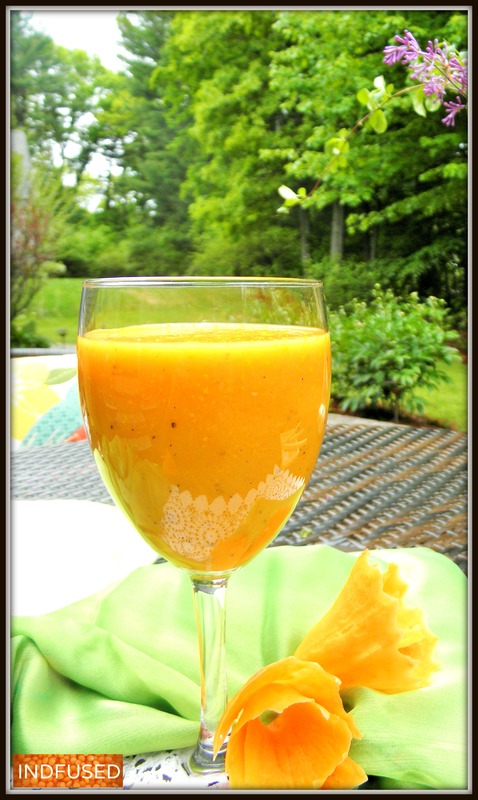 Gajar Halwa Infused skinny Smoothie! So I thought of a carrot/gajar halwa flavored almond milk smoothie! It definitely satisfied my craving for gajar halwa, and I can have it as often as I like! And unlike gajar halwa, this is ready in a jiffy too! In a microwave safe bowl, combine the grated carrots and the ghee. Microwave on high for 3 minutes. Remove from the microwave and stir in the crushed saffron. Let the mixture cool. In a blender, add the cooled carrot mixture, almond milk, sugar and the powdered cardamom. Blend until smooth and creamy. Masala Peanut Bhujia in 4 ½ minutes! I will pass this on to my younger daughter who is starting a blending business. This sounds healthy and delicious. I would add orange, tangerine, or pineapple juice. Wow! What a fun business your daughter is starting. It really is healthy and delicious. Lovely idea, Sandhya. Taste hi aur health bhi! Oh laa laa. Where do u get these awesome ideas from? This looks real good Sandhya – do you know I’ve never tried almond milk before? I see so many recipes that call for that, and shame on me, I’ve never tried it. Now, your recipe gives me a reason to purchase my very first carton :). I’ll let you know how it turns out. I love the addition of cardamom, and that ghee has to give it an amazing taste! Loretta, I had never got almond milk before either but with gajar halwa on my mind, I picked it up in Trader Joes and loved it! The smoothie really satisfies the craving. Do let me know how you like it.